Thank you very much for all that you have done for Jake. He really benefited from your program and your individual instruction. You guys do such a great job at instilling confidence, discipline and self-respect, and we are very grateful for that. The Bannisters have been instrumental in my development as a martial artist and in obtaining my black belt. Since day one, the Bannisters have been there for me as instructors, mentors and friends. They have a true love and dedication to martial arts and it shows in every class. Teaching comes naturally to them and in my opinion is their greatest asset. They are great with students of all ages from children to adults and tailor their instruction to fit the individual student’s needs. You have given me really great advice and guidance as well as helping me to better understand martial arts. You have helped me to realize that martial arts is really an art, and what I mean by that is you make it your own; it's not the same for everyone. Anybody can learn punches and kicks, as well as teaching them to others, but it takes someone special to teach a student and young man in this modern world how to have respect for others no matter who they are, discipline to follow through and never give up, and most importantly, to have courage when faced with towering obstacles. Thank you for teaching me these values that I will take with me in my school and work life. I couldn't have become the black belt that I am today without your help and guidance. Your knowledge and experience helped me so much, especially as a woman. You were able to help me when I struggled with a technique, and were always there to offer support when I wasn't successful the first time! Having you as an instructor was a huge inspiration for me, especially since I fell outside of the age range of the "typical" student. Achieving my black belt later in life was a huge accomplishment! I couldn't have done it without you! This is the best martial arts center I have trained at! Quest Hapkido is the perfect place to get a great workout and in shape for the summer season, meet great people and make friends. My husband and I both fell in love with the art of Hap Ki Do. We continue to pursue its study because of the possibility that our children will love it as we do. We hope to be an example to them and to others to show that it is possible to share a life experience as a family, just as the Bannisters do daily. So, if you are trying to make a decision about an activity for your family, I would say you are making an excellent choice in choosing to study martial arts with some of the best. I have trained with both Debbie Bannister and Jim Bannister and they are amazing instructors. If you desire to learn a martial art that can be depended upon in any given situation, you have come to the right dojang. You will not learn situational self-defense. The techniques the Bannisters teach are the most effective self-defense that you will ever learn. Not only will you learn to defend yourself, you will learn very important life lessons in respect and self-discipline. Training at Quest Martial Arts will transform you from the inside out into the person you could only dream about. I have known the Bannister family for over 8 years and I give them my highest recommendation as professional Martial Arts Master Instructors. I would trust them with my own family and I have brought my own students to many seminars where they were instructed by the Bannisters'. As both a Martial Arts Master and an educator, their standard of ethics is of the highest value and they will always put their students' safety before anything else. They come from a Martial Arts lineage of top-notch professionals. Rest assured, should you chose Quest, you have made a sound decision. When I first began taking Hapkido, I was unsure if I would be able to participate. As you are aware, I have had prior back surgery from an auto accident as well as bilateral wrist surgeries from a horse back riding accident. Thanks to both of you, I have learned that there are many different ways of completing my techniques and accomplishing my goals in martial arts. I had no idea when I began taking my Hapkido classes that you both could adapt the techniques and teach me specific ways to complete my training. I enjoy my classes very much and look forward to many years of training with you both. I have found the folks that run Quest to be some of the nicest people you'd ever want to meet. The best part is the high level of Martial arts they are teaching you just don't see much anymore. I highly recommend this school. 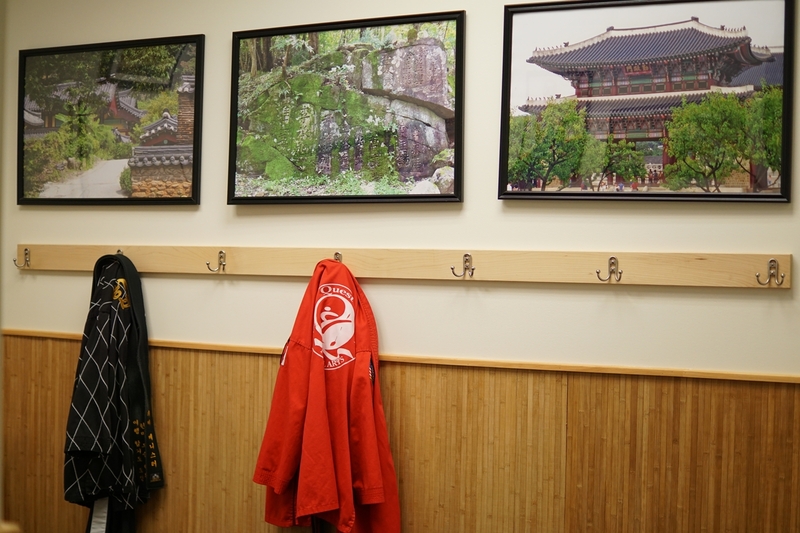 Mr. Jim and Mrs. Debbie have such a wealth of knowledge and one of the most extensive backgrounds in Hapkido that it makes for a great environment for the kids to learn in. Their approach to working with the students is done so that each student’s needs are looked after one by one and no child is made to feel left out. As instructors, they are among the best we have been involved with. Mr. Jim and Mrs. Debbie always made sure to talk with the parents so they are kept aware of their child's progress. Now, after six years, we have come to see our son become very self-confident, attentive, secure in himself and a very skilled martial artist - thanks to the Bannisters. Little did we know back then, when our son started with Mr. Jim and Mrs. Debbie, that we had just met two of the most influential people in our son’s life and in ours too. In the six years that I have been associated with the Bannisters, I have come to understand what a difference an attitude of caring concern can mean for the well-being of a school’s students. Together, they have demonstrated that you can uphold thousands of years of respect and tradition while at the same time encouraging close relationships and a “family-like” atmosphere. My daughter and I have been the recipients of many hand-written notes of encouragement and supportive “life lesson” affirmations by the Bannisters as we navigated multiple uncertainties in our everyday lives. Without this association, it is very possible that our lives would not have taken the “black belt” shape they now possess. I have been training in the martial arts style of Hapkido for close to 8 years now. I have enjoyed what Hapkido has added to my life in the sense of confidence, awareness and long-lasting friendships. What both Jim and Debbie provide to their school is a place of comfort where someone, no matter their experience, can learn something new and, at the same time, be in a fun and comfortable environment. What can I not say about this place? It's incredible. You will learn quality self-defense as well as get a good workout in every class. Everything is headed by Master Jim and Master Debbie. They are each very humble, easy going people that truly do care for every one of their students and will work with them as much as possible. To top it all off all of the students there, regardless of age, are great people and have taken in this great learning atmosphere created by both Masters Jim and Debbie. I recommend everyone to at least give it a shot for a month, you really have nothing to lose!